Ryzen is here and AMD is back to challenge Intel’s CPUs. With a new CPU family in the market, this also means that motherboard manufacturers will also have a new entire motherboard lineup for the Ryzen system. There weren’t a lot of motherboards to choose from when the Ryzen 7 was first launched. During the initial days, there’s the Asus Crosshair VI Hero, Gigabyte’s AX370-Gaming 5, MSI’s X370 Titanium and some other X370 motherboards. But those are top of the line motherboards (or higher-end) from their respective makers; and they’re quite expensive. Thankfully, today there are more X370 motherboard variants to choose from, including B350 motherboards. Today, we are going to look at and review the MSI X370 Gaming Pro Carbon motherboard. It’s significantly cheaper compared to the X370 XPower Gaming Titanium; it has the essential features that most gamers or professionals need; and it has RGB lighting! If you are planning to build a new Ryzen system, whether with the Ryzen 7 or Ryzen 5, continue reading our MSI X370 Gaming Pro Carbon review below and find out if this motherboard is the one for you. 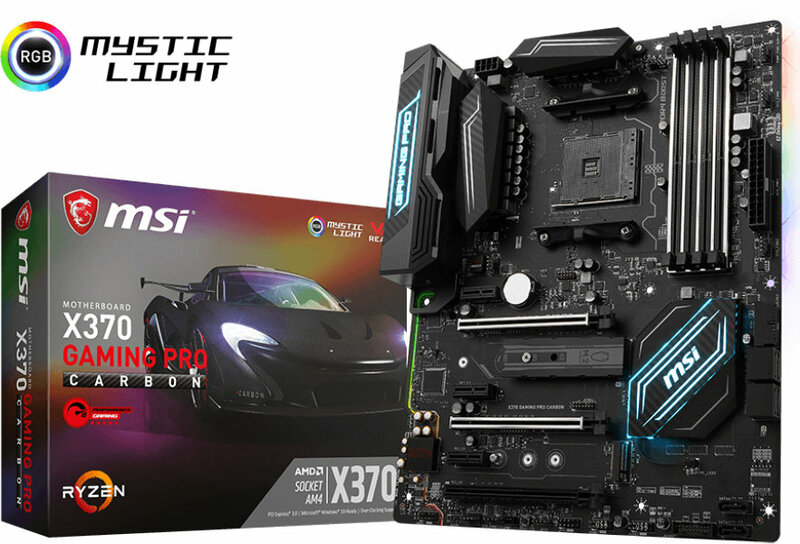 The MSI X370 Gaming Pro Carbon motherboard offers a sweet spot for those who are looking for an X370 AM4 motherboard that is feature rich, fully capable and is built with the essentials without spending too much on a motherboard. This motherboard features an all-black design with matte finish, and silver / RGB highlights making it compatible with most color scheme. The Gaming Pro Carbon features AMD’s latest X370 chipset, meaning it supports both AMD CrossFireX and NVIDIA SLI for multiple graphics card configuration. It basically supports AMD’s new Ryzen processor and (upcoming) 7th generation A-series / Athlon processors for socket AM4. AMD has also announced that the socket AM4 will be around for quite some time, this means future AMD processors using socket AM4 may be compatible with this motherboard. No need to change the entire system, only the processor when you plan to upgrade in the future. At least that’s the idea. This motherboard also supports up to DDR4-3200MHz, thanks to the latest BIOS update. The MSI X370 Gaming Pro Carbon also features dual M.2 supporting NVMe up to 32Gb/s via PCI-E Gen3 x4, up to USB 3.1 Gen 2, Intel Gaming LAN, golden audio jacks with S/PDIF, PCI-e steal armor and fan headers for both case fans and water cooling. I guess this motherboard is built with most (if not all) the essential features that a professional or gamer needs in his system. The only thing missing left is probably a built-in WiFi connection. You’ll have to opt for the X370 Gaming Pro Carbon AC if you need a motherboard with a WiFi connection; or simply buy a WiFi/BT add-on card. Let’s proceed to the next page and get a closer look at the motherboard itself. You can also check out the table below for its complete specifications. * 7th Gen A-series/ Athlon™ processors support up to 2400 MHz only.